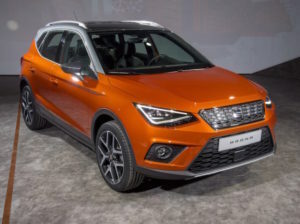 Seat has confirmed UK pricing and specification for its Arona compact crossover. Providing the brand with a rival to models such as the Nissan Juke and Renault Captur, the Arona is priced from £16,555 and joins the existing Ateca midsize SUV with a larger seven-seater model due next year. Built on the same MQB A0 platform as the new Ibiza, the Arona will be offered in SE and SE Technology entry grades as well as sports-focused FR and FR Sport models and flagship Xcellence and Xcellence Lux trims. In addition two launch versions will be on offer: SE First Edition and Xcellence First Edition models. Standard kit on the SE includes 17-inch alloys, bi-colour roof, power-adjustable door mirrors, LED daytime running lights and tail lights, automatic headlights, air conditioning, height-adjustable front seats, and a five-inch touchscreen. Engine line-up covers a 1.0-litre three-cylinder petrol engine and 1.6-litre diesel – both with 94 or 114bhp – and a 148bhp 1.5-litre four-cylinder engine with cylinder deactivation technology. The Arona makes its UK showroom launch on 17 November.For more of the latest industry news, click here.